A beautiful pair of dangling amethyst and diamond drop earrings set in solid .925 sterling silver for a rock bottom deal price of just $22 shipped! 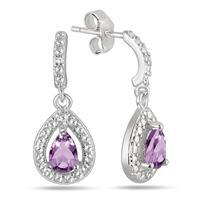 An unbeatable offer on a lovely pair of all natural gemstone and genuine diamond earrings! Spam Protection: * Answer of 5 + 1?